One aspect of the all the stories covered so far in this series of articles is that they have all been produced past 1970. Moving away from this and to the true early years of Doctor Who opens up an interesting point in context of synaesthetic relations to the stories involved; can a colour association be made with a story that was made in black and white? Both the First and Second Doctor had no opportunity to explore colour yet, recalling stories from their eras can very easily produce a set of colour relations, all built from different aspects and products produced after the event in question. Though the focus of this section of the analysis will start with the VHS covers, as with previous articles, with so many stories still missing from the archives, it will be shown that pictures, advertisements, magazines and all sorts of other paraphernalia have had an impact in recalling black and white stories through colour. For now though, a look into more VHS covers will ground the relationship in the basics. 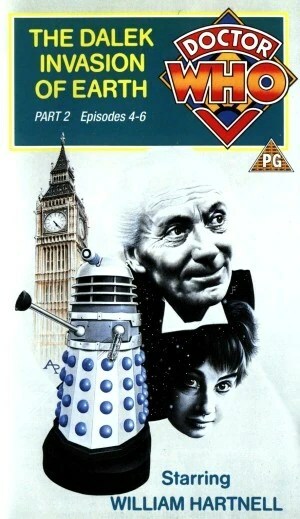 Like many of the most exciting VHS releases, the First Doctor had many of his stories ironically deleted in the mid 1990s meaning that even the most critically lampooned of stories would be considered a real treat; a rarity like a precious jewel in the dusty stalls of collector’s fairs. Two stories in particular spring to mind from this era, both because of their frankly odd packaging decisions. Both The Web Planet (1965) and The Dalek Invasion of Earth (1964) are double releases yet they are releases as two separate video cassettes in two separate boxes instead of the, soon to be normal, double VHS box set. This means that, though the covers are both pretty much identical and in black and white, a decision was made to use different colour patterns for the title squares even though they’re for the same story. One of these is odder than the other. Whereas the colours for The Web Planet are an inversion of each other, the colours for The Dalek Invasion of Earth are entirely different. Not merely the fact that these stories have no colour in to even vaguely signify where the design should go, the fact that a black and white story deserves two colour representations is mind boggling to the synaesthesiac. One is purple with yellow while the other is blue with yellow. However, the link of black and white stories to the colour of purple was handily made before this was viewed, thanks to previous purchasing of The Web Planet. This means that recalling the television version of The Dalek Invasion of Earth has blue as its main denoting factor in spite of the colour not appearing in the story at all. Even the new DVD release plays on this blue relationship. Its cover uses blue as its only colour motif to denote the story with a very typical photo montage. 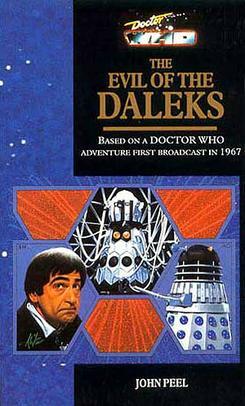 Whether the design had any influence from the VHS cover is debatable, yet this diffusion of colour ideals can be seen in a number of stories from both the First and the Second Doctor. 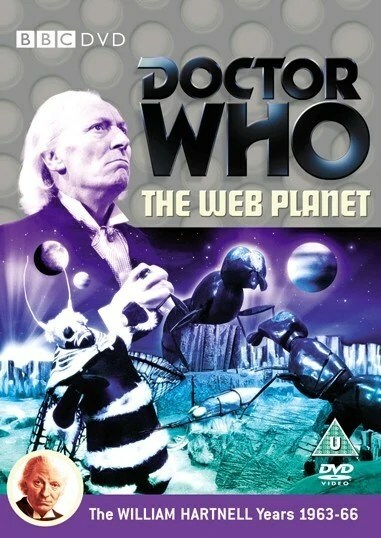 The Web Planet is a better example of this as its DVD cover shows an almost the exact shade of purple as the VHS cover. Though a strong yellow was also present, purple seems to be the perfect colour to represent Vortis; a planet with a very colourful array of life in spite of it being filmed in black and white. It’s not out of the realms of fantasy to believe that the Vaseline smothered camera lenses are filming a planet tinged with a luscious purple. The DVD cover basks in this colour and so this double representation means that The Web Planet is easily recalled as a story of purples, not of blacks and whites. This cross over between DVD and VHS is something that will be looked at in more detail in the coming articles, but suffice to say, its relationship is at its strongest with stories from the 1960s. This is not doubt down to the initial colour relations for these stories being built through early exposure to the VHS covers but colours can come from other areas too. The generation of fans brought up on Target books will very probably have a colour relationship just as, if not more, built up than with the VHS covers. The subtle use of red on the VHS cover for The Mind Robber (1968) may have been taken for the use of red typography for its DVD cover but it could have equally taken its dusty pink theme from its vibrant Target novelisation cover. This cross over is, however, more linked between VHS and DVD than Target novelisation and DVD, perhaps owing to the age of the designers yet defining this relationship is hard for the VHS era synaesthesiac. The only exception to this is when discussing the sadly large number of missing stories from both black and white eras. There are a number of ways to experience these episodes whether they be audio, recon, Target novel or telesnaps, yet even the stories with little or, in some cases, no visual relation at all can have some colour signifiers. With all of the stated methods of experiencing these stories, it’s actually quite unsurprising that these have built up. Fury From The Deep (1968) was always going to have a green tint to it, with its narrative about murderous seaweed. This has played some part in its advertising which varies very little in colour schemes. Victor Pemberton’s Target novelisation showcases this perfectly with which greens and minty blues are the main theme for this apparent “bumper!” edition. 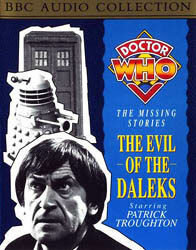 The green continues with the audio cassette which uses green to differentiate itself from its other Second Doctor missing stories. Even the BBC CD that seemed to take an age to be released eventually went for the greens as a story signifier (though this was often the case for this range of releases). One particular memory in green which comes to mind for the Second Doctor is one built up through a particular magazine special. 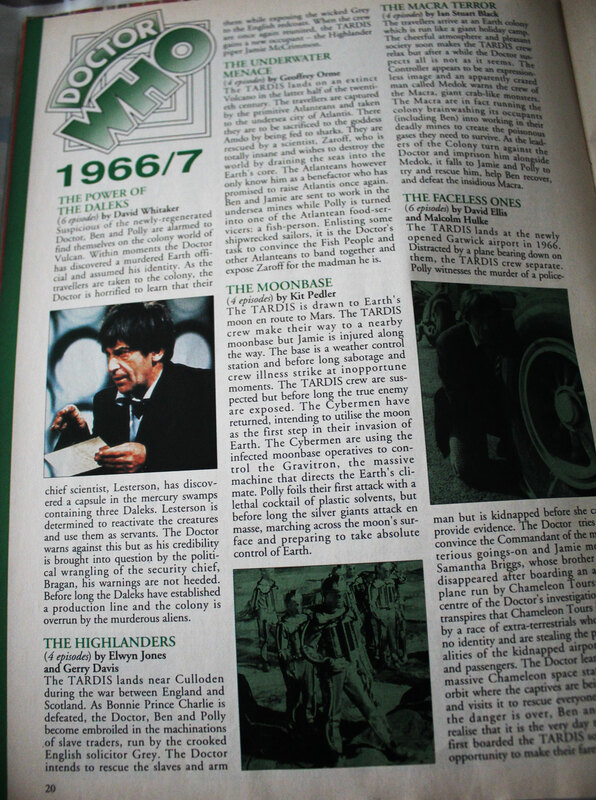 The 30th anniversary DWM magazine colour coded each era (sometimes with clashes against this particular writer’s colour coded system) with the Second Doctor’s being defined by green, giving the edges of a magazine a green strip and giving the black and white images a green tint. This isn’t an original colour for the images used (though one original colour image of an Ice Warrior further points to green) but is instead a creative decision with Hartnell’s stories having an oddly orange tint too (hinting at the future covers for The Aztecs (1964) DVD cover). This isn’t the green that Terrence Dicks constantly refers to when waffling about monsters. This is a definite colour relationship built upon simply by the fact that there is very little to go on, even though the story had no colour visually in the first place. This is the most definitive area of colour relations in Doctor Who, perhaps almost ironically. 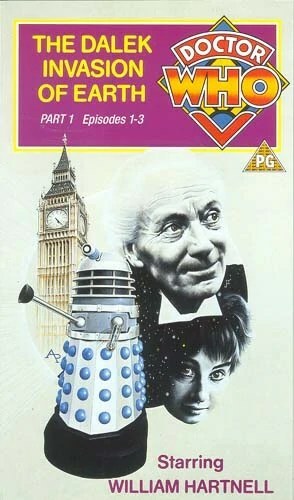 The relationship can be further seen in stories like Evil of the Daleks (1967) which boasts a double colour relationship (albeit not in green). The story was one of the last (if not the last) to be novelised, far after the time of gentle, whimsical Target novelisations. Its frankly beautiful artwork has come to define a story of reds and of blues culminating in quite possibly the best post card giveaway DWM ever had. It seems fitting though that a story with so many different settings and scenarios has two definitive colours. The blues of the artwork found their way into the audio cassette while the reds played the major role in the CD cover of audio. 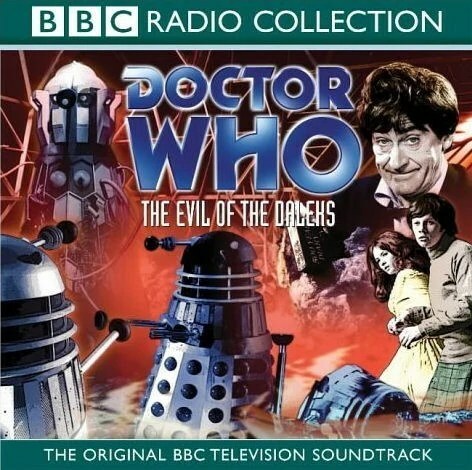 Even with the greens of the 30th anniversary special looming at roughly the same time, Evil of the Daleks comes out as a red/blue story full of imagination and variety. These missing stories have produced some of the strongest and most interesting synaesthetic relationships having been built up in a far more complex way than the surviving VHS stories. The wiping of these classics is a crime that seems increasingly unlikely to be irreversible. It seems fitting then that they are the stories with the strongest sense of colour in recollection with colours seeping in from all sorts of mediums. It is in these other mediums where our analysis will go to for the next part; in seeking out the thought behind the bold colour choices of photo-montage VHS and DVD covers.